Dedicated to cutting-edge bathroom furniture, Toilets and washbasins, Bauhaus has earned a leading position within the UK bathroom industry. 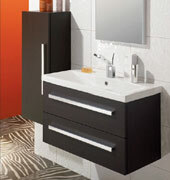 Bauhaus is a name you can trust to deliver on style, performance and product quality. Covering sensational sanitary ware in an array of shapes and sizes, beautiful basins for bathrooms and cloakrooms, plus style-led furniture capable of storing your everyday day toiletries with ease. Here at Fountain Direct, we sell a range of bathroom heating appliances to complement the look and feel of your modern Bauhaus bathroom. Choose from flat towel warmers or a more curved radiator. We also sell the accompanying valves sets.